Walk around the crater of an active volcano and luxuriate in natural hot springs on this private, 3-hour shore excursion. 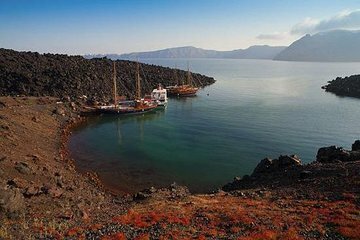 Begin with a boat trip across the cobalt waters of the Aegean Sea, and enjoy a leisurely walk to the summit of the volcano. Hear of the volcanic explosion that wiped out Santorini’s earliest settlements, and then make the most of free time to relax in the supposedly healing waters of the hot springs.